While Garmin is known for its production of top-of-the-line GPS running and sport watches, it also makes great accessories. One that has caught the eye of many runners lately is the new Running Dynamics Pod, which was announced with the release of the Garmin Forerunner 935 watch. But what exactly does the Running Dynamics Pod measure, and is it worth upgrading from previous Garmin accessories? This review will explore everything you need to know. The Running Dynamics Pod is designed to give you all kinds of useful in-depth data about your runs, in six main categories: ground contact time, ground contact balance, cadence, stride length, vertical oscillation, and vertical ratio. For serious runners, this information is invaluable in making improvements in areas such as pace and form. We’ll get to each of those categories in just a moment, but first, it’s important to note one of the Pod’s main features: it’s size. This device is absolutely tiny, with dimensions of only 1.5” x 0.9” x 0.8” and weighing only 12g. Simply clip it onto the back of your waistband while running, and you’ll instantly forget it’s even there. It’s very convenient! The first area that the Pod tracks is Ground Contact Time. Garmin describes this as the amount of time in each step that you spend on the ground while running. This stat is measured in milliseconds, and a shorter ground contact time is generally considered to be “better.” Longer ground contact times can be a signal of over-striding, something a runner could work to correct once aware of it. Ground Contact Time Balance monitors ground contact time between the left and right foot to create an overall measure of symmetry, displayed as a percentage of time spent on each foot. Runners should aim for the most symmetrical running form possible. Cadence is simply how many steps you take per minute, both feet included. It should be noted that the recent Garmin GPS watches measure cadence, so this is sort of a double-feature of the Pod. While the “ideal” cadence depends on each individual runner and their goals, 180 steps per minute is generally considered a good target. The Pod can help runners recognize where their cadence needs improvement, which can help prevent injuries. Stride Length measures how far the runner travels with each step, and varies from runner to runner depending on body type and flexibility. Runners should take note of how their stride length changes with pace, cadence, and other factors in play. Vertical Oscillation is often described as the amount of “bounce” in your steps during your run. Vertical oscillation is measured at torso level (hence why the Pod is worn on your waistband) and measures how much distance your body travels up and down with each step. In general, lower vertical oscillation is “better” and tends to indicate a more experienced runner. It also means less impact on your body, which is better for preventing injuries. Finally, Vertical Ratio is a measure of efficiency that takes into account vertical oscillation (above) as well as stride length. Vertical ratio is expressed as an overall percentage, with a lower percentage being preferable over a higher one. The lower the percentage, the more energy-efficient the runner’s form is. For serious runners, especially those who love data, these dynamics provide detailed information that can be extremely useful in continuing to improve – not to mention, looking at all the numbers and seeing changes over time can be fun! For such a small device, the Running Dynamics Pod is both powerful and perceptive. As mentioned, the Pod clips onto the back of your waistband and allows you to essentially forget about it from there. The Pod connects to - and transmits data to - your compatible Garmin GPS watch, allowing you to view the metrics in real time on the watch interface. 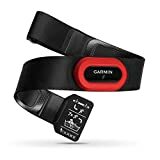 Is It Worth Upgrading from Garmin HRM-Run? For those who already own Garmin’s heart monitoring chest strap, the HRM-Run, the running dynamics described may look familiar – and they should, because they’re the exact same dynamics measured by the HRM-Run! 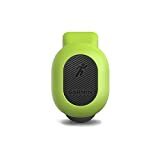 The Running Dynamics Pod is available for purchase directly through Garmin; however, it is also available through third-party retailers such as Amazo﻿n. With a little shopping around, the Pod can often be found on sale or at a discount. It can actually be found at a very reasonable price for such a useful tool!